Contemporary upholstered chair, ideal for receptions and front of house. Soft brushed fabric with modern oak coloured legs. Overall W x D - 590 x 440mm. Supplied as a set of 2 chairs. Guests are often important people; they could be customers or potential business partners, so you will want to provide them with a great first impress of your premises. To do this you will want to kit out your reception area with furniture that best represents your company and makes your visitors feel welcomed and comfortable. 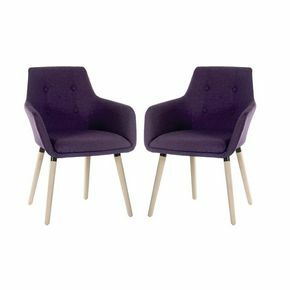 These modern reception chairs are a great addition to any reception or front of house area, thanks to their contemporary upholstered design. They have soft brushed fabric with modern oak coloured legs, finishing the stylish appearance. 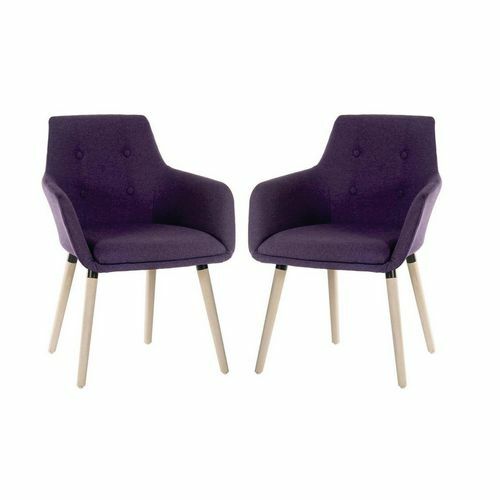 There are two colours to choose from; graphite or plum and they are supplied as a set of two chairs. The seat height is 470mm making it ideal and comfortable for most users and the overall dimensions are; W x D - 590 x 440mm. Our modern reception chairs will provide excellent furniture for any reception or front of house area and they come with FREE UK Delivery.